I love liquorice, especially the salty stuff from Scandinavia. I was delighted, then, when I discovered this book by a fellow member of the Guild of Food Writers. Liquorice started off as a medicine but has become more popular as confectionary. Wilson explains the history and production of liquorice from Pontefract to Calabria, and develops 38 recipes, from drinks and savouries to desserts. I’m keen to try out her liquorice brownies (chocolate and liquorice is a wonderful combination), Pontefract-style cakes, liquorice and fennel trout filets. Nice photography by Nicki Dowey, and a picture for every recipe. Segnit’s last book, The Flavour Thesaurus, was a world-wide award-winning hit, even visible on the shelves of the Camerons’ Downing Street kitchen. Eight years later, we have been gifted with Lateral Cooking, again different from virtually every other cookbook out there. No photos, no lifestyle aspirations, no pouting pictures of the author. This is a serious piece of work for those interested in thinking and experimenting with food. Recipes are grouped into families or, more accurately, a sideways genealogy: Batter can become Yorkshire pudding or pancakes or tempura or blinis or churros, depending on thickness and flavour. The next chapter, Roux, another combination of butter, flour and milk, expounds upon both béchamel sauce and less obvious in-laws such as velouté soup. It’s fascinating and engrossing. It makes you want to cook more – and there can be no higher compliment. I’m a fan of one-ingredient cookbooks, obsessively researched and explored. Here is everything you ever wanted to know about flour. Western cookery, based on bread/pastry/pasta, is reliant ultimately on wheat, or grass seed, the basis for our most common flour. McFadden explores 45 kinds of other flour, from almond, lupin, cricket to sorghum, water chestnut and pea. Christine’s knowledge is evident when she explains 00 flour, the Italian system of categorising flour by the finesse of the grind, as opposed to the British system, which is classed by protein/gluten content. 00 flour is the most finely ground, but has a protein/gluten content of anything from 7% (good for cakes) to 14% (for pasta or bread). The higher the gluten content, the stretchier the dough, the higher it will rise. Kapoor’s book has a premise: good cooking requires an appeal to all the senses. Most of these senses are well-known: sight, the appearance of a dish; smell, as flavour is largely expressed via the nose rather than the mouth; touch, which is texture; taste, spanning sweet, sour, bitter, salt, umami. I’ve never before seen sound suggested as a component. Kapoor reveals recipes for crunchy ‘loud’ chickpeas, talks about the slurping of soup, a compliment to the cook in Japan, the squeakiness of black Chinese mushrooms in a salad. I thought of the squeakiness of cheese curds in Canadian poutine. Perhaps in the era of easily available free online recipes, recipe books are obsolete and writers are turning to more conceptual ideas, as seen in this book about the role of time in food. 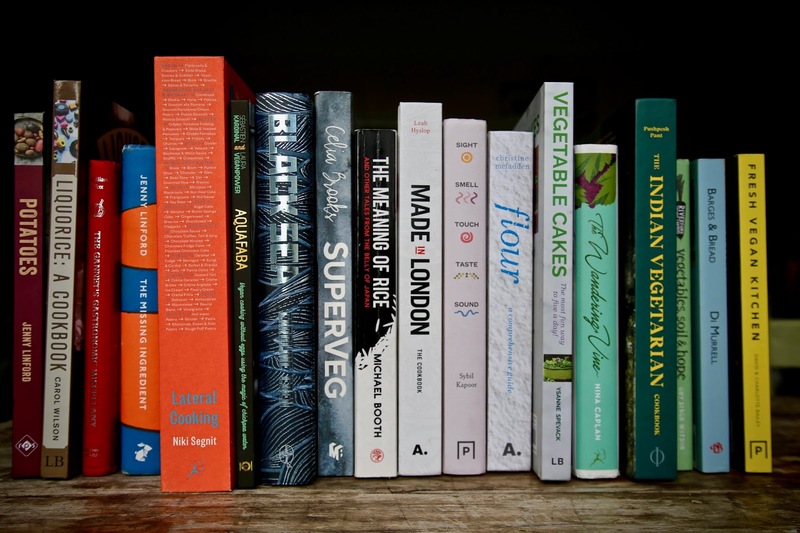 The book’s structure is cleverly divided into units of time: seconds count when blanching vegetables or making caramel; minutes for fast food or tea; hours for sourdough bread or pulses or stock; days for smoking or pickling; cheese and beer demand weeks; the seasonality of different months; years for wine and whisky. By far the largest chapter in the book is dedicated to minutes, neatly displaying society’s obsession with time-saving when it comes to making our food. There’s a reason Jamie’s 30- and 15-minute recipe books were best sellers. I always think that drinking old wines is a form of time travel: reliving the weather and conditions of years before you were even born. France-based Londoner Nina Caplan, who writes an award-winning drink column in The New Statesman, probes Roman history in a wine-drinking travelogue. The Romans influenced wine making, leaving ruins from Champagne to Bordeaux, from Catalonia to Sicily. The title of the book alludes to the legend of the Wandering Jew and the Jewish roots of the author. From the beautifully designed black and silver striated cover to the photos, maps and foodie anecdotes, this book atmospherically conjures up the Black Sea region. Only slightly saline, this body of water is surrounded by Ukraine, Romania, Bulgaria, Turkey, Georgia and Russia, perching on the rim of a bowl that Eden calls ‘the world’s greatest kitchen’. The recipes are simple and doable: borek and Tsarist cakes, pilaf and fish stews, tahini and poppy seeds. It makes me want to pick up my knives, my notebook and go. I interviewed Michael Booth earlier this year. He and his family have become quite famous in Japan, part of an anime cartoon series. This book has chapters on Japanese ingredients such as nori, sweet potatoes, ramen, koi, rice, and whisky. The chapter on yuzu inspires me to visit the island of Shikoku where they have the harvest in November. Next year I promise (to myself). The tone is dry and comedic but not lacking the investigative research of a Japanophile. If you are interested in Japanese food or visiting Japan, this is the book for you. Restriction breeds invention and some of todays most revolutionary cooking comes from vegan chefs. Aquafaba, or bean water, was invented in 2014, by a couple of vegans, working separately: a French singer, Joel Roessel and an American software engineer, Goose Wolht. The slightly scummy water drained from a can of chickpeas (or other beans) can replace egg, when whipped up. You can make vegan meringues for instance. And it doesn’t taste of beans, I promise. This book runs through savoury and sweet recipes for aquafaba and a few things to do with the actual chickpeas. Try this at home, combine 100ml of bean water with 100g of caster sugar and whisk till firm then bake. Books like this make great stocking fillers for quizzers, know-alls and fun fact hoarders such as myself. It’s entertaining with a host of fascinating tidbits and information. A bit irked that I’m not mentioned in the book under ‘Underground Restaurants’. Why not Killian? Bit sick of being erased by the foodie establishment. Telegraph journalist Leah Hyslop has written a book celebrating London recipes, some long forgotten (Tottenham cake), others well known (Chelsea buns). 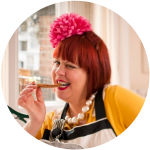 She also traverses the current London food scene from coffee shops, best bakeries, London-cure smoked salmon and the gin craze. The contribution of immigrants to our creative and cosmopolitan cuisine is detailed: the story of curry, how Caribbean food came to London, and Chinatown. Let’s face it, London is the centre of the world and more books like this are needed to celebrate it. Elegant photography by Martin Poole. Jenny has had a prolific year with books on time and spuds. As a carboholic, this is right up my street. I was even touting around a potato book proposal myself for a while there. When writers create a book, choices are made, and the first job is to devise a structure. Another writer would perhaps have assigned the categories of floury v waxy; old v new; or even styles of cooking (salad, fried, baked) and the appropriate potatoes for this purpose. Linford elects to appeal to how spuds make you feel: summery, sustained, comforted, spiced up or luxurious with respective recipes such as Spanish tortilla, miso potato soup, gnocchi, potato chaat masala, and truffle mash. This is the perfect gift book for coeliacs worn out from devising gluten-free recipes. Chips with everything! Celia is one of the best vegetarian chefs in the UK, although she originally hails from the States. She also does a brilliant food tour of Borough Market in London. Brooks explores 25 vegetables from carrots to kohlrabi, coming up with unexpected ways to make Brussel sprouts and cabbage interesting. A perfect cookbook for meat reducers or vegetarians; there are enough recipes for vegans to enjoy it too. Murdoch make beautiful books so not sure why this didn’t have the hardback it deserved. I’m not convinced about the design but it has the usual brilliant photography by Jean Cazals. Not the famous 1960s photographer, but the former head chef at Saf, one of London’s first raw vegan restaurants, sadly closed. Everything about this book is good: great recipes and tips but it isn’t saying anything different to my book V is for Vegan. The photography doesn’t do it any favours and there aren’t enough photos. I think the Baileys should have held out for a higher quality book. That said, it is a good source for vegan recipes. Pan-Indian vegetarian cookery by a well known Indian food writer and theorist. The recipes are very original: quince with lotus root, bamboo shoots with green chillies, morels in yoghurt sauce. This is not your British Curry House fare but for adventurous curious devotees of sub-continental cuisine. Guy Watson is the charismatic head of Riverford Organics, from whom I’ve been getting my weekly organic vegetable for a decade now, complete with a newsletter. This is a collection of Guys’ newsletters, with short chapters, easy to dip in and out. It’s organised into seasons, but the years jump about from 2002 to 2017. That’s the thing about farming, seasons happen every year, and there are differences every year, but essentially the problems remain the same: what type of potato to grow? what to do about slugs? the search for the perfect tomato cultivar? rain or lack of it? why won’t customers be more adventurous and start to like cardoons? Although Guy Watson was drawn to farming from his eighth birthday, he only discovered his ‘veg calling’ at the age of 26. Today he’s a self-proclaimed ‘veg nerd’. I’m increasingly interested in food from a farming perspective as opposed to celebrity chefs for the last couple of years, spending the last few months travelling Britain and interviewing organic carrot farmers. I think a little more adoration of farmers and a little less junk foodie tv fandom would be a good thing in our society. Di Murrell spends much of her time on the water, mostly on British canals. This fascinating food history book deals with grain transport on the river, the time when domestic commerce was usually via the inland water network, prior to the first British motorway built in 1959. The chapters cover pre-history, the earliest farmers, the Romans, London and the Thames and at the end of the book, her personal history on the water. She talks of ‘the constancy of bread’ as a food product to be transported, and of course families and businesses living upon the water needed to bake their own. She veers into Michael Pollan territory, that cooking is essential for humans, that raw ingredients were never enough to sustain our large brains. There are recipes: the earliest form of bread- flatbread; Essene bread – sprouted and ‘cooked’ in sunlight; Ezekiel bread – a bible recipe that God gave to the Israelites; Maslin bread – a medieval loaf; Manchet bread- using beer; an Anglo-Saxon bread. Murrell delves into the history of flour, what type of flour we use, mostly imported Canadian, and artisanal flour from local mills (something I always buy when I come across them). Today fewer people eat proper bread as a result of the mechanised Chorleywood process “though problematically, growing numbers of people are finding that this same daily bread makes them ill”. I read this book while on the Norfolk Broads earlier this year. It’s an interesting, gripping, philosophical, practical, food history from an original perspective. The cover of this book shows a ludicrously bright green cake, which turns out to be a ‘rocket’ powered cheese cake. We all know about carrot cake, but author Spevack goes further, much further. She has devised sweet recipes using vegetables: velvet artichoke heart cupcakes, spinach macaroons, and a gorgeous courgette rosette tart. If you struggle to get your kids to eat vegetables, there are some great ideas within this beautifully styled and photographed book. If, as an adult, you battle to reach your seven a day, you may find the solution here. Disclosure: All links to Amazon will earn me a tiny sum if you buy through this page. It all helps to keep the blog going. Ps: I also highly recommend Victoria Moore’sThe Wine Dine Dictionary but I can’t find my copy of it right now. Perhaps that’s down to my new ‘colour coding’ system of filing. I’ll be back to talk about this.